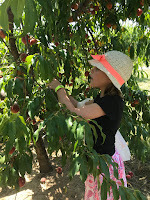 One of my family's favorite activities is to find a farm where we can pick our own peaches/strawberries/blackberries/etc. We always love getting away from Northern Virginia and being able to enjoy time in the country. 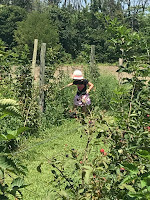 The last two years as I've watched my girls troupe through the fields and stick their hands into bushes and trees for the desired fruit, I've started to consider all of the skills my daughters are using and practicing. So many of these are skills we strive to help children gain inside our classrooms and Occupational or Physical therapy centers. All of the picking requires a certain amount of visual/spatial motor planning. They need to scan the bushes or trees for the fruit, eyeing the small black berries hidden under the green leaves. Then they need to figure out how to put their arm inside the bush to carefully pull off the berries (with just the right amount of pull - too much will smoosh them, too little will leave the berry on the branch). When they've finally achieved their mission they get the best natural reward of all - being able to pop the berry into their mouth. Sometimes it amazes me that the child who is not able to find her own pair of shoes in the morning is so capable at finding blackberries. 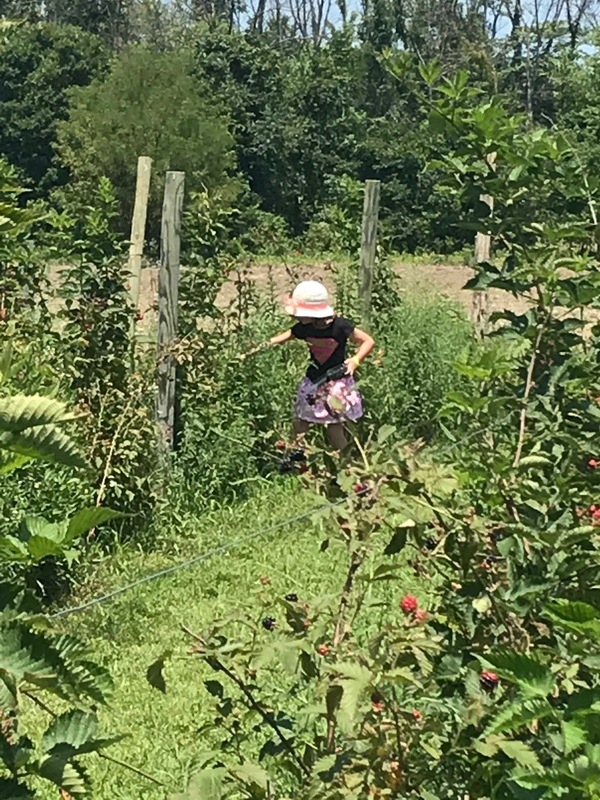 Looking for the perfect blackberry can be like playing the I Spy or Where's Waldo books, but in 3-D. And yet, my daughters are far more likely to look for berries than they are to play the visual-spatial strengthening games I set up that would practice the same skills. 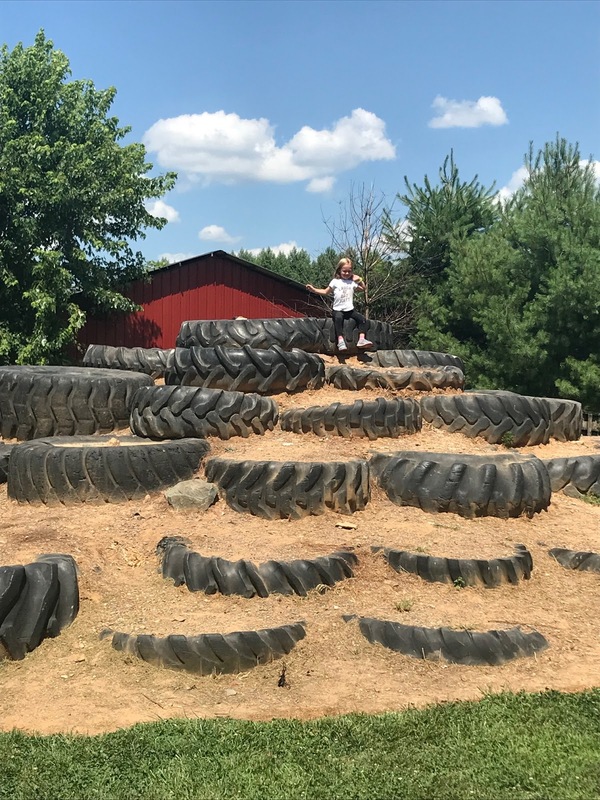 Our favorite place to go is Great Country Farm. After picking we put our harvest into a cooler in the car and head off to their never-ending play space. 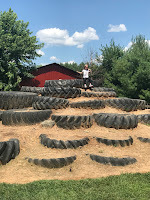 Again, this play space gives so many opportunities for kids to work on those gross motor skills that we'd otherwise be trying to create in physical therapy. 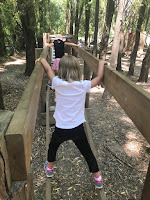 There is an Ninja Obstacle Course, rope maze (apparently my spatial problem solving needs work because we never did solve it...), and fields of play equipment that beg kids to climb, jump, and run - all skills that work on their visual/spatial motor planning. There is even a barn filled with corn kernels for your sensory-seeking friends. 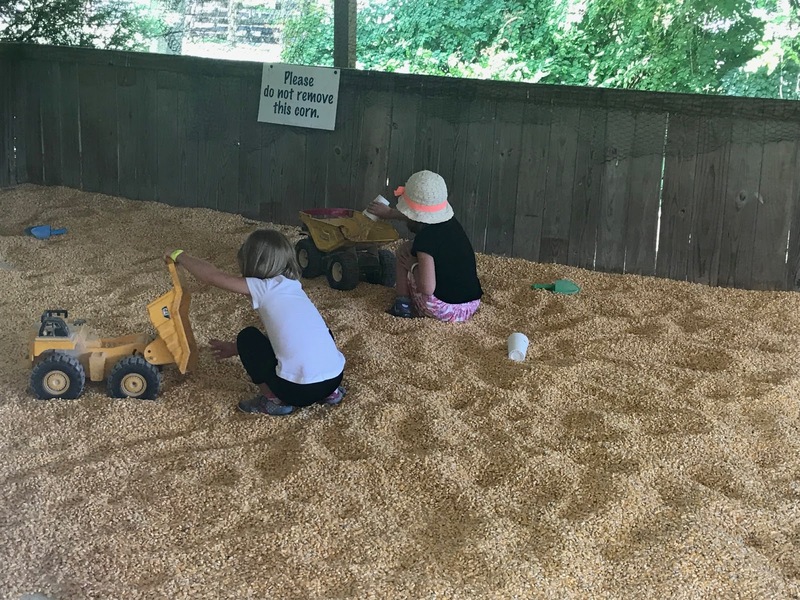 My girls could spend all day pushing trucks through the corn. 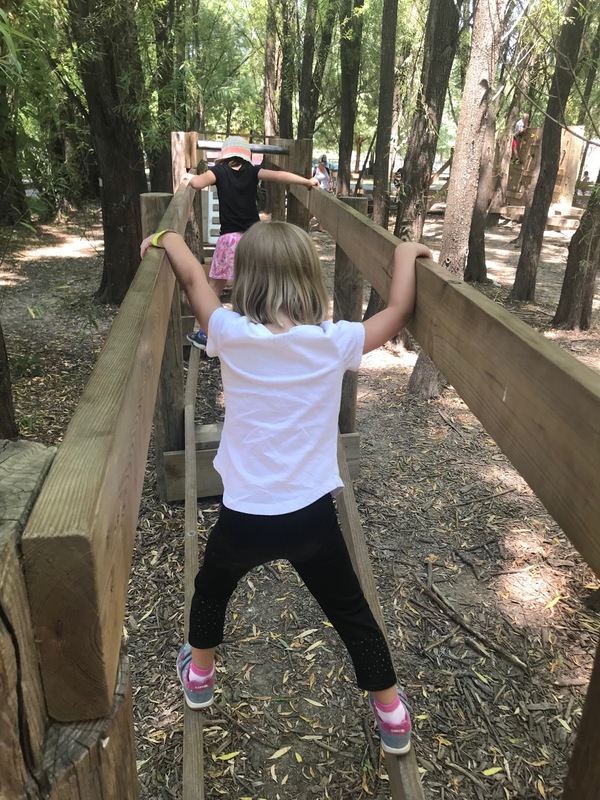 The more coursework I take through the International Council of Developmental Learning, the more I realize how vital Visual/Spatial Motor planning is to our kids development. In order to feel safe enough to navigate our way through a school or classroom without bumping into someone else, in order to feel comfortably socially with peers and to know that they suddenly won't slam their bodies into you, we need to have a strong sense of visual/spatial motor planning. We have to coordinate not just what our eyes see in front of us and how much space we have between us and someone else, but we also have to be able to move our body within that space. This takes repeated practice of testing our own strength and seeing how quickly or slowly we move throughout time and space. Visual/Spatial Motor planning also is needed when we read and write. Our eyes need to be able to work together with our body to coordinate what they see, process it, and control a pencil appropriately. 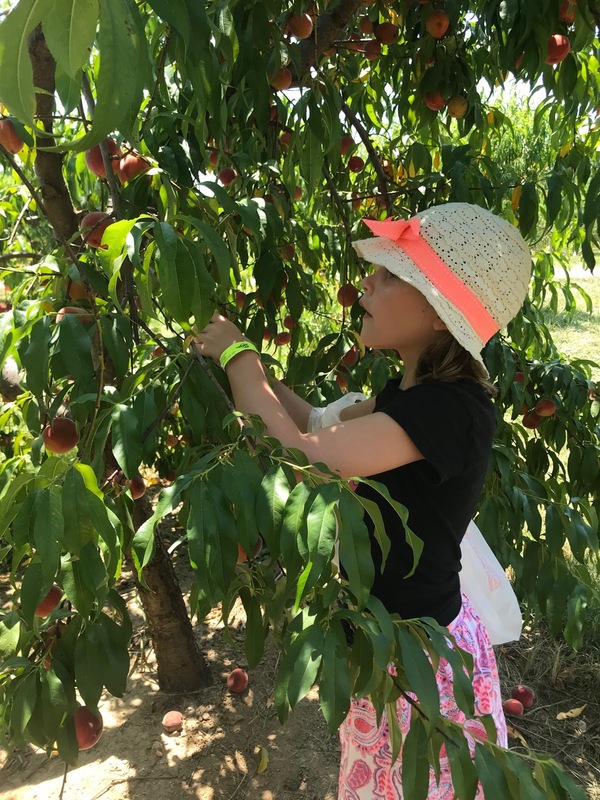 Fruit picking gives us a natural opportunity to practice these skills in an inclusive, typical setting, with delicious rewards at the end.